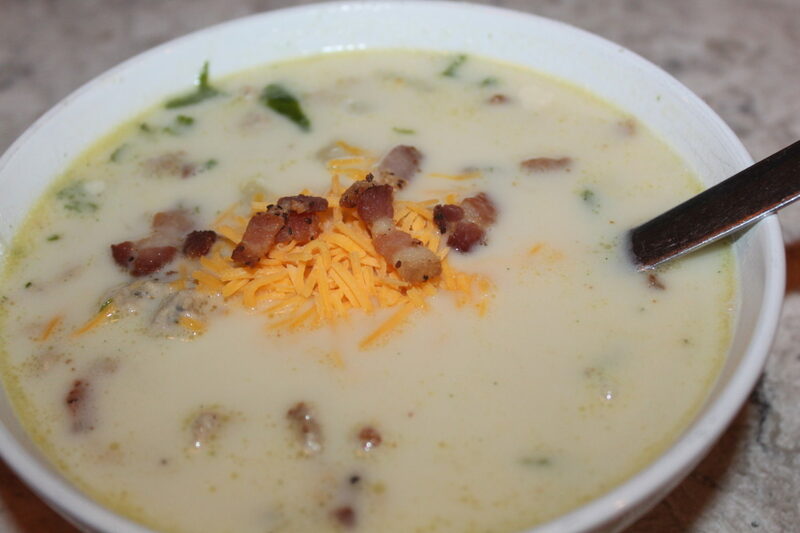 Zuppa soup is one of the most craved soups in our household. Although its formal name is Zuppa Toscana soup at the Olive Garden restaurant, in our house, we shortened it to plain old Zuppa soup. In an effort to replicate the same hearty soup in our kitchen, we have combined the following ingredients together to give us that exact flavor right in our own kitchen! We included directions below for both traditional stove top, and and InstantPot recipes. There are a couple of hints to make it taste just like the original version. First of all, make sure to use either hot sausage, or if you prefer a little less heat, use a mild sausage and add in hot pepper flakes to your liking. Zuppa soup is supposed to have a little zing, so omitting the heat all together will not produce that same flavor found in the restaurant. Also, you must saute your onions. If you add them in raw, the onion flavor will overpower the dish, resulting in disappointment. And as with most soups, you can make this ahead of time and re-heat the next day. 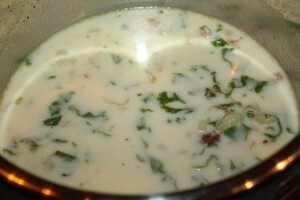 In fact, we love to eat leftover soup the next day, as the flavors have had time to meld together overnight. 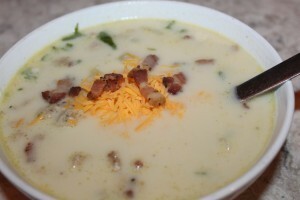 So next time you are in the mood for Zuppa soup, you can skip the wait at the restaurant and make it right at home! 1. Add bacon and onion to the skillet and cook until bacon pies are crispy. Add to stockpot. 2. Add in potatoes, garlic, and chicken stock. Bring to a boil and cook for 30 minutes, or until potatoes are tender. 3. Add in the kale and cream. Simmer for 15 minutes, until kale is wilted and tender. Serve with cheese on top if desired. A pot of zuppa soup waiting for taste test. 1. Select the Sauté function and add bacon and cook until crisp. Remove bacon to paper towel lined plate. 2. Add onions to the hot pot and sauté for about 3 minutes. Add sausage and sauté until browned. 3. Add garlic to the sausage and onion mixture and sauté 1 minute. 4. Turn off Pressure Cooker and drain grease, if necessary. Add chicken broth and potatoes. 5. Lock lid and place valve in the sealed position. Cook at High Pressure for 5 minutes. 6. Allow for 10 minutes of natural pressure release and then do a quick release. 7. Add kale to the cooking pot and stir until wilted. Add cream and stir to combine. Place in serving bowls and top with bacon and grated/shredded cheese (optional). In a large skillet, brown sausage and then place into a large stockpot. Add bacon and onion to the skillet and cook until bacon pies are crispy. Add to stockpot. Add in potatoes, garlic, and chicken stock. Bring to a boil and cook for 30 minutes, or until potatoes are tender. Add in the kale and cream. Simmer for 15 minutes, until kale is wilted and tender. Select the Sauté function and add bacon and cook until crisp. Remove bacon to paper towel lined plate. Add onions to the hot pot and sauté for about 3 minutes. Add sausage and sauté until browned. Add garlic to the sausage and onion mixture and sauté 1 minute. Turn off Pressure Cooker and drain grease, if necessary. Add chicken broth and potatoes. Lock lid and place valve in the sealed position. Cook at High Pressure for 5 minutes. Allow for 10 minutes of natural pressure release and then do a quick release. Add kale to the cooking pot and stir until wilted. Add cream and stir to combine. ← The Struggle To Keep Our Bees. What Is Really Happening To Honeybee Hives? 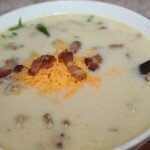 A neighbour of ours introduced us to this recipe and my hubby and I have been making this soup for several years now. It’s SO good! I have made this soup many times and it just keeps getting better. The use of kale is brilliant as I wouldn’t eat kale otherwise. I use the hot sausage and also baby red potatoes, as they don’t get mushy like others might. Highly recommend this recipe for those who want that true zuppa soup.